Adventures In Storytime (and Beyond): Review of "Creepy Pair of Underwear!" 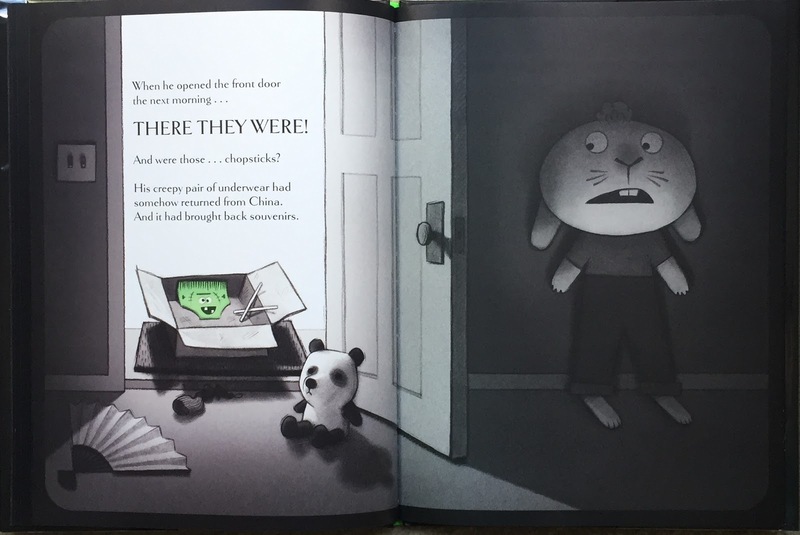 Jasper Rabbit returns, but he is not a little bunny anymore! His mother takes him shopping for new underwear, and Jasper insists he is old enough to choose his own underwear now that he is a big rabbit. No more tidy whities for him! He chooses some cool looking underwear with a scary face on them, despite his mother's misgivings. 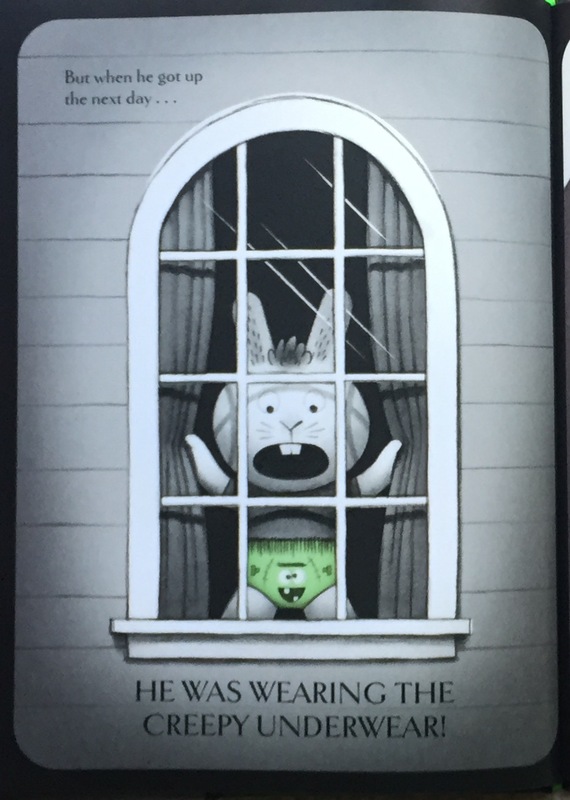 That night, he decides to wear his new underwear to bed, and of course he doesn't need a nightlight or the door cracked, because he is a big rabbit now. But, when the lights go out, he makes an unexpected, and unpleasant, discovery. 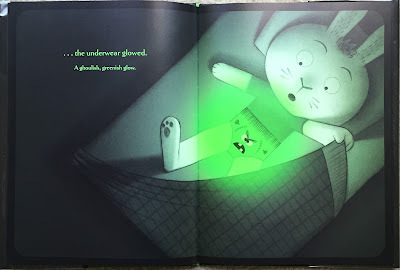 His new underwear glows in the dark - a horrible, ghoulish, green glow! 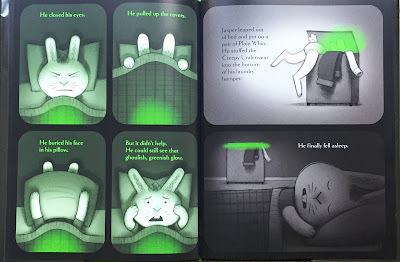 The creepy glow keeps Jasper from sleeping, no matter how hard he tries, so finally he takes them off and stuffs them down in the very bottom of his clothes hamper. Finally, he can sleep! But, the next morning when he wakes up, Jasper is suprised and frightened to discover......he is WEARING the underwear! What? How?? Now things really are creepy! No matter what he tries, they keep coming back! 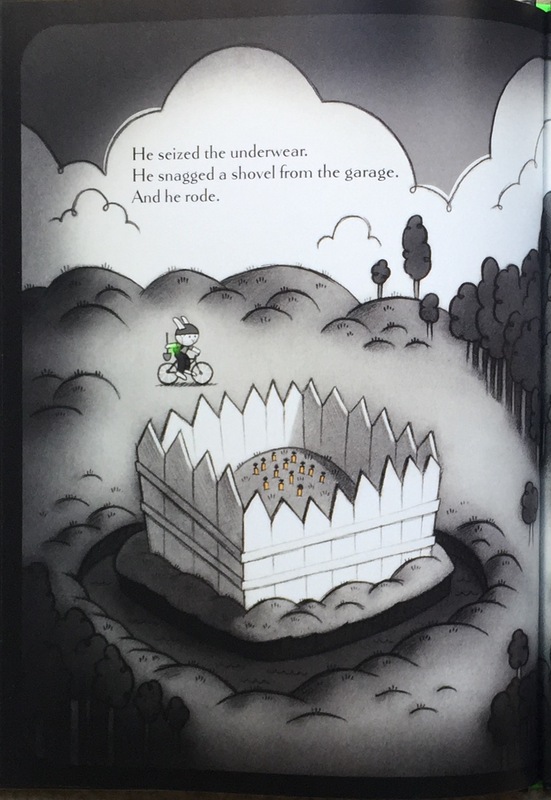 Will Jasper be haunted by the creepy underwear for the rest of his life? The creative team that brough us Creepy Carrots has done it again! I predict this will be a huge hit, and I can't wait to use it! 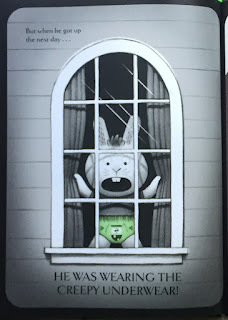 I LOVE this, and it had me laughing out loud more than once as I read it, especially when the underwear not only returned from China, but also brought souvenirs! 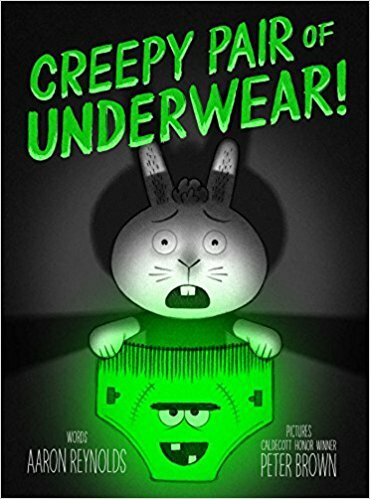 While anything that mentions underwear is guaranteed to get laughs from the kids, this story has it all: clever humor, suspense, an age-appropriate level of creepiness, and Peter Brown's wonderful illustrations really set the mood. Another Caldecott nod, perhaps? 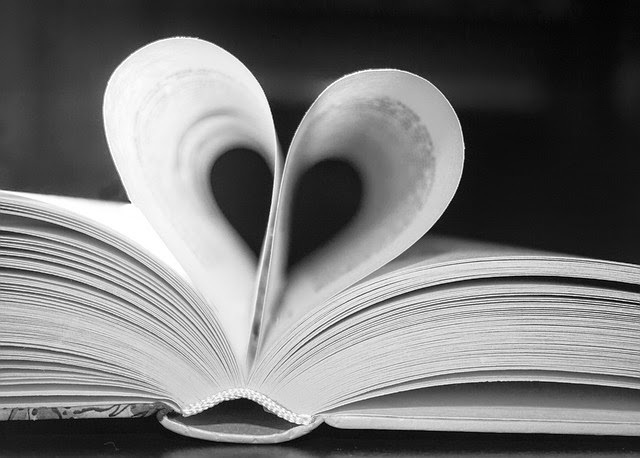 I think this book would appeal to all kids from the ages of 3 or 4 to maybe 8 or 9, and some adults as well. I think this could be another good selection, along with it's predecessor, for a somewhat creepy-scary story to read around Halloween without actually being about Halloween if that's something you need or prefer to avoid. Of course it would be fun any time of the year! But if you have adults who don't appreciate underwear humor, it might not go over as well with them, so know your audience.